Crafted one vat at a time and skillfully aged at The Cellars at Jasper Hill, Cabot English-Style clothbound is truly something special. A handsome natural-rinded traditional cheddar, Cabot Clothbound is bandaged with muslin and skillfully aged a minimum of 10 months. 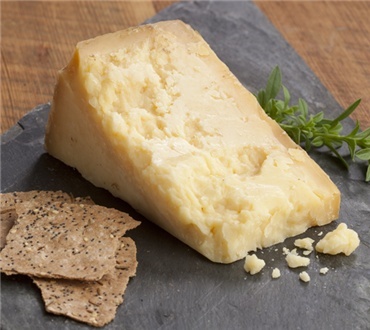 With all the characteristic feel of an English-style cheddar, the flavor profile is at once sweet, savory, nutty, and tangy. With a smooth, slightly crumbly texture and perfect flavor balance, this cheese is pleasing to connoisseurs who enjoy a bit of bite, and those more tentative cheese tasters. The extra care involved in curing Cabot Clothbound Cheddar requires a customized aging environment, with proper temperature, humidity, and airflow. At Jasper Hill, 22,000 square feet of vaults nestled underneath grazing pastures offer the perfect environment for aging Cabot Clothbound. With each cave resting at distinct temperature and humidity levels, calibrated for different cheese styles monitored by an experienced team, Cabot Clothbound undergoes a constant cycle of care during which the wheels are tested, tasted, and monitored for quality during their entire life cycle. We are pleased to offer you this unique taste experience, enjoy! I Was Wrong At First; It's Great! Since submitting my review of January 16, my opinion has changed - for the much better. I'm now almost out of the 8-ounce wedge I'd tried and wish I'd ordered a more, at the time (it was on sale). I'm not sure why, but I've become more receptive to its complexity and like it a lot. I've been enjoying the cheese either by itself (letting it dissolve in my mouth), or gently melted over some of my favorite foods (e.g., sauteed-and-steamed greens; warmed rice and beans, etc.). Next I'll try the 4 Year Old School and compare. Love this cheese so much I always get it for the holidays. So worth it and actually better price than the small pieces I can buy locally. Best cheddar I have ever had.